Discussion in 'L2 Server Advertisement' started by la2dream, Sep 4, 2018. 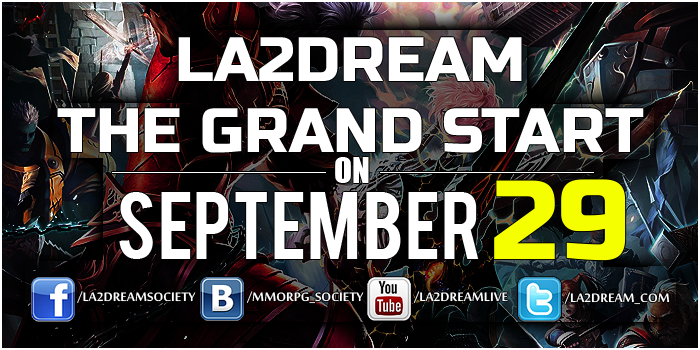 Will you play on grand start of La2Dream? Dear Veterans and future players of our unique world https://la2dream.com/ Interlude x50! We are glad to announce that once again open the gate to our magical world! Here you will meet old friends as well as enemies, you will find a sea of fascinating entertainment and sincere emotions from all heartily! In our world, all are equal, where everyone will follow the norms and the basic rules of the game! La2Dream team promises stable and operational support for every player of our world! The Grand Opening will be on September 29 at 20:00 UTC +3 on Moscow time! Please bring this information to our veterans and future players! Be ready and look forward to the opening!